IML (Indus Mark-up Language) is an advanced numerical operating programming language embedded with packet compression algorithm to enable electronic data transaction at higher speed and in a highly secured fashion. It was introduced by MITYUNG to enable matrix manipulations and plotting of functions on browsers. IML is developed for numerical computation on browsers and optimize cloud computing, this also allows the accessibility of bit manipulation and allegorical computing capabilities. Security and Performance of internet based application is great challenge for "e- commerce" systems however, IML enables superior quality electronic data transactions over other conventional mark-up languages. Darmiyan SOA is an advanced logic fusion service oriented architecture framework that enables index manipulations in server. This framework was introduced by MITYUNG to bring down the resource utilization of any cloud computing applications. As the world is becoming increasingly open towards leveraging Global resources and information services to optimize their business investments; Cloud computing is expected to become potential base for global and local business enterprises. Take an example of a person ordering meal from a restaurant; In a conventional set-up, restaurant guy takes requirement from client and proceed to process meal as requested, however in smarter set-up like fast food joints, pre-cooked arrangements are made to ease the delivery system. But, in both scenario there is lag time to process meal within the establishments (server) then time to make delivery on requested address. What if an algorithm turns establishments into pure sever mode to offer ingredients based on meal requested by client and hygienic meal processing happens within delivery system (on the way to requested address)? This would definitely save tremendous amount of resources needed within establishments (server) and make business processes more efficient. Point a case, if meal is ordered by huge mass at a time then system in conventional set-up would multiply time to process, however smarter set-up would act little more efficient than conventional one. Think of technological algorithm wherein establishment acts as server to offer ONLY ingredients and meal processing happens in delivery system, then resource requirement in establishment does not go up indeed but delivery system resources requirement shoot-up in all kind of set-up. Nonetheless resource required in the sever goes drastically goes down and all the requests are fulfilled in time within expected quality parameters. Here is the difference brought by set of technologies innovated by MITYUNG in cloud computing ground for the global enterprises catering to mass user base. Technological advancements in various aspects of human life have established supremacy amongst other species. Technology has played and will play an important role in human life, and offer new and better ways to expedite human efficiency in the upcoming centuries. The application of information technology has enabled vast array of information exchange in the wide spectrum of human interfaces and civilization progression. Technology advancement has accelerated human efficiency multifold but highlights of recent technological breakthrough results in selected fields, giving an outlook on game-changing developments in the coming decades. Keeping abreast of new technological breakthroughs and vast array of information is a mix of state-of-the-art overviews to draw trend of upcoming human civilization. Staying healthy is an imperative issue and a buzzword amongst the human fraternity globally. The healthcare profession, like many other businesses, continues to function within the realm of technology, Physicians encounter the use of technology on a daily basis. Technology must be the basis for changing the way patient care is being delivered. Clinical Information Systems have replaced paper charting. Duplicate charting and documentation are eliminated and error reduction allows more time for and flexibility in delivering patient care. Gone are the days of time spent trying to decipher illegible handwritten physician orders. But despite of all the technological advancement made by human curiosity, the human aspect of leveraging and delivering information technology for patient care is not sufficient even today. In the context to Indian scenario, preventable diseases dominate over curable and curable diseases turns to terminal due to ignorance and patients’ access limitation to RMP & quacks. Rural Indians spend 1.5 times more compared to urban counterparts for same illness because rural physician to population ratio lower by 6 times and rural hospital beds to population ratio lower by 15 times. Almost 22 million Indian populations pushed below poverty line annually due to healthcare expenditure alone because hospitalization expenditure of patients are either funded by borrowed money or sold assets. Although medical informatics applications have increased significantly within the past few years and information technology influencing mode of healthcare practice but healthcare professionals are facing lot of challenges in learning and working within the age of technology. In addition, advancements in information technologies have also become an integral link to resource optimization and continuing education. Healthcare administrators have begun to utilize informatics applications to assist with staffing, managing budgets and disseminating information. Since Physicians and medical assistants spend a greater portion of their time documenting patient information and adapting to electronic documentation however, they yet follow conservative process to communicate with external world for patient care. Information communication technology advancements surfaced over the last decade in education, research, entertainment, administration and commerce has become inundated with society but healthcare yet follows conventional system. We must perceive the changes in healthcare practice as a challenge rather than a risk to our business and assist others through the transitions. Some noteworthy technological advancement in healthcare includes image-guided therapy for the interventional radiologist and surgeon using multimodality hybrid imaging technologies. Such technology blends CT-integrated robotic systems and information communication technology for percutaneous needle insertion, electromagnetic tracking for laparoscopic positional correction, and fusion of live ultrasound imaging with CT datasets. The aim of these technologies are to allow image-based treatment planning, guidance, monitoring, and controlling of treatment effectiveness. Handheld units are utilized to transmit patient information directly to electronic medical records (EMR) providing more efficient documentation with increased accuracy and consistency. Present information technology have eliminated the need of healthcare profession with applications that check for drug interactions, calculate dosages, analyze lab results, schedule procedures, order prescriptions, and automate other clinical tasks, thus reducing the probability of errors and increasing patient safety. One downfall to the use of technology in healthcare is the potential breech of confidentiality and security pertaining to patient information. At all times, the healthcare provider must be cognizant of guidelines regarding patient privacy, security and confidentiality of patient information. Since it has been established that change due to advancements in information communication technology will continue in healthcare, providing information regarding the benefits gained by the new system will augment acceptance. Technological advancement will definitely influence critical aspects of future medical care. 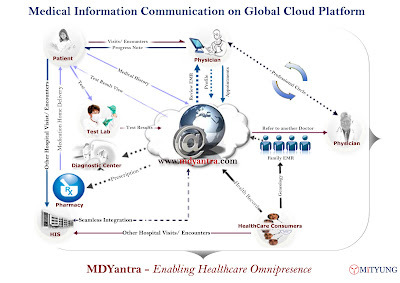 Global distributed and centralized medical system like www.mdyantra.com, a global healthcare ecosystem on cloud would be giving an outlook of game-changing developments in patient care the coming decades. MDYantra is aimed at change the pathway of patient care presently being practiced and delivered; thereby changing the health-care paradigm globally. “Darmiyan SOA” is an advanced logic fusion service oriented architecture, capable of bringing down the resource utilization of any cloud computing application to the greater extent compared to existing frameworks in the universe of information communication technology. The term, “Darmiyan SOA” is a virtual blend of Darmiyan (means “equilibrium" or "in-between” in Urdu/Persian) and SOA, wherein "Darmiyan" signify balancing of scope of services within information communication platform and "SOA" is universally known approach for building loose coupled software system architectures. Darmiayn SOA is union of service components placed in various layers of system architecture like “Human LIFE”, a temporary union of five mechanism placed in three layers- Physical, Mental, Spiritual; each component act drive to balance life with the environment. First component “Interface” lies in Physical layer and composite adaptors like ear, nose, tong, eye, and skin of human, to interface with external world. Similarly Darmiyan SOA adaptors are communication medium as five physical facets in human life those considered as medium for five basic senses. Second component “Perception” lies in Mental layer, which perceives the information received from adaptors in the physical layer and integrates with logic, like sixth sense of human life integrates impression of the physical facets - five senses with the mind. Third component “Notion” too lies in Mental layer, which conceptualizes the information received from physical layer integrated with schema formed within logic. Human conception also conceptualizes the impression after perception is formed in mind. Forth component “Intelligence” too lies in Mental layer, which stimulate the system to take action on concept. As human tantras motivate action on conception formed within mind. Fifth component “Decision” lies in Spiritual layer, which integrates the components of Perception, Conception, and Intelligence then discernment to derives the final output; the way it derives conscious in Spiritual layer in the human life. Medical Imaging science is most important invention in the HealthCare space and PACS (Picture Archiving and Communication Systems) had been developed in an attempt to provide electronic storage, retrieval and access to images simultaneously from multiple sites. PACS acquires DICOM (Digital Imaging and Communications in Medicine) from multiple modalities and encapsulates information to stores and transfer for diagnosis reporting. 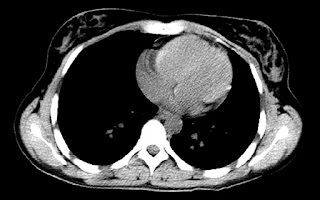 PACS replaces film based medical imaging to electronic imaging, which eliminates the need to manual interface of printing and transporting the patient diagnostic images to Radiologists for reporting as well as referring physicians for orientation. With the advancement in the HealthCare informatics, the digital medical image management (PACS) market is growing leaps and bounds. Although market is very mature but unavailability of platforms for transferring DICOMs on web has become hurdle in enabling healthcare omnipresence. The advantages to go digital is well documented and experienced by the developed world. The challenge in India is to get this technology to reach mass and get online healthcare service, so they can also reap the benefits of going digital. Now, what can facilitate DICOMs (X-Ray, CT, MRI, and other medical images) viewable on internet enabled devices (PC, tablets, mobile, p-top, and l-top) for online diagnosis by simulating modality console on web browsers? PACS can be established on cloud computing platform to supports Tele-Radiology and filmless radiology environment. It also allows swift diagnostic service for superior patient care and enhances business referrals by optimizing patient-care workflow. Such advanced internet based technology will enable HealthCare providers of all sizes to take advantage of this technology by instituting imaging centers on cloud. After the advent of fire, internet is another landmark development in the history of mankind. Internet has dramatically changed human lifestyle, both in personal and professional subjects and also transformed the way we think, govern and perceive human interactions. Transactions carried out by means of electronic data interchange, and other means of electronic communication, commonly referred as "e- commerce", needs superior efficiency and high level of information security. As the world is becoming increasingly open towards leveraging Global resources and information services to optimize their business investments; Cloud computing is expected to become potential base for global and local business enterprises. Economic turbulence has also forced enterprises across the world to redefine their business objectives and strategies. I envision, within next few years, the business hubs completely adopting cloud computing for their business process applications and business transactions but there is a further need towards adoption of futuristic technologies to optimize their IT investments. Now it is important to enable unified information infrastructure, a framework which makes transaction fast and secure. Suppression of Centuries by foreign rules (From East India Co. to outsourcing service dependencies) has come to an end now as INDIAN technologists have broken shackles of foreign slavery and lengthened the vision for future INDIA. Mityung is an Information Infrastructure Engineering and zero foot-print technology Company, equipped with technology excellence and thought leadership; conceived to drive transformation and growth of technology innovation in cloud computing. Mityung is born with the vision to Crystallize Human Intelligence through Innovation of Information Infrastructures. Our proclaimed goal at Mityung is technology innovation that can enable global business enterprises for their domain sovereignty. • Script: IML (Indus Mark-up Language), a Packet Compression Algorithm embedded mark-up language to enable electronic data transaction at higher speed and in a highly secured fashion. HealthCare Ignorance & Disconnected Health Information Systems! HealthCare ignorance to the roots and HealthCare insufficiency in the world causing indefinite tribulations to the human kind, and disconnected healthcare systems fabricate health information islands due to unavailability of Patient Medical Records when it is needed. Scarcity of doctors in the close vicinities has bounced difficulties to access proper healthcare on time and the disconnection of systems has colonized inability to get adequate healthcare service for survival. Unavailability of global collaboration platform for doctors and absence of centralized Electronic Medical Records (EMR) for consumers have created gaps amongst consumers and healthcare providers to achieve precise diagnosis. Every year more than million people die across the world due to lack of sufficient healthcare access, however doctor always demand individual & family health history for precise health problem diagnosis, but unfortunately they have to rely upon patient’s memory. Over the past few years, a variety of technologies have been deployed in an attempt to channel information and make it more usable in the healthcare establishment management. However, these initiatives have rarely achieved their goals in building “healthcare ecosystem” and facilitating desired “point of care”. Despite of all the technological advancement made by human curiosity, Telemedicine is still a challenge for remote and primitive areas. Every human species has fundamental rights to receive healthcare support and comfort but Healthcare is often overshadowed by the appeal of cutting-edge technologies, gizmos and gadgets. Each generation demands to bear better health and live longer but regardless of exponential advancement in the healthcare space globally, the human aspect of leveraging and delivering information technology for patient care is not sufficient even today. Healthcare universe is “ever-evolving” continuum of care in the clinical chain and suppliers typically have developed strategies only for the individual healthcare facilities. In order to integrate the healthcare information, a consumer oriented state-of- art solution; there is a need of global ecosystem for healthcare fraternity, which can enable consumers to maintain their medical records and doctors to provide omnipresence healthcare across the globe by increasing precision in patient health problem diagnosis. Advanced Technology innovations are expected to break shackles of conventional healthcare systems, those operating in silos and also redefine global healthcare system to facilitate healthcare problems solution through a powerful, flexible and yet easy-to-use health information system targeting point-of-care, decision support and research uses. Studies have repeatedly proven that paper medical records are costly, cumbersome, easily misplaced and very difficult for any meaningful decision analysis. Compared to paper records, utilizing an Electronic Medical Record system is a rapid and efficient method to preserve critical medical information. Health information "mining" analysis is needed by healthcare providers alike to improve and fine-tune clinical practices. In a world in which economies are globally interdependent and the productivity of nations relies on the health of its citizens, the sustainability of the world’s health systems is a national competitive issue and a global economic imperative. Now human approaching to manifold advance generation and getting new physicians with new paradigm with different fundamentals, although specialists and specialized care are available globally but at times are not approachable due to geographical boundaries and individual capacity. It is time to look globally for healthcare endeavors as local solutions are dangerously provincial and, xenophobic in extreme cases. Moreover, there is a moral obligation to create a global sustainable healthcare system.